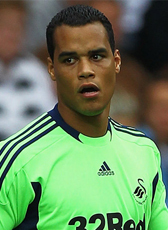 FC Utrecht youth product Michel Vorm signed a 3-year contract at Welsh club Swansea City in August 2011. The Holland international goalkeeper signed the contract for a fee around £1.5M until June 2014. He extended his successful stay with another two seasons until 2016. In July 2014 after playing a few minutes in the Worldcup, Vorm was transferred to Tottenham Hotspur on a 3-year deal. His transfer fee was around the 6ME. In his first period he got some chances as first choice but he is mainly the backup goalie of the Spurs. In December 2016 his contract was extended with another season until 2018. In June 2018 with another season.